On August 22, the Syrian Arab Army (SAA) Tiger Forces successfully continued their operation against ISIS and liberated Dahr Hamra, Latum Ghabiri, Souq, Qasr Hayr Sharqi and Kuwayr in the province of Homs. This advance reduced the distance to Sukhna from 10 km to 5 km. Meanwhile, the Syrian Defense Ministry released a statement claiming that ISIS terrorists are on the run. According to the statement, ISIS members were fleeing the area amid large number of losses in the manpower and military equipment. 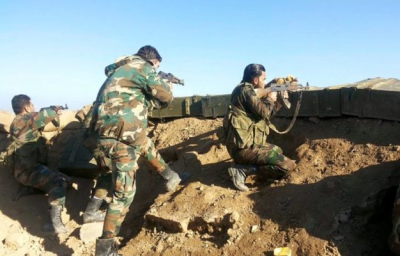 On August 23, the Tiger Forces developed momentum in the Zaheq Mount area. They need to secure the entire mountain to close the pocket officially. Separately reports appeared that on August 22 the 800th Regiment of the Syrian Republican Guard and allied units advanced 30km along the Palmyra-Deir Ezzor highway liberating Talat al Krad and Jabal Dahik ash Sharqi. Media also speculate that the Tiger Forces seized Rujm al Hajanah and Jabal Dabbah in the direction of Deir Ezzor. If these advances confirmed, this will mean that the Syrian military is not going to delay the Deir Ezzor operation and will likely push towards the city as soon as the ISIS resistance disappears north of the Homs-Palmyra highway. East of Salamiyah, the SAA retook Jani Albawi, Tal Albawi and Albawi from ISIS terrorists and established a fire control over Salba further increasing pressure on ISIS positions north of the ISIS strong point of Uqayribat. ISIS has many fortified defense positions in the cross-country terran inside the pocket. Thus, the progress inside the pocket is slower than in the desert area. The Hezbollah media wing in Syria has released a video showing members of Kata’ib Sayyid al-Shuhada using combat unmanned aerial vehicles (UCAVs) against ISIS targets in the Syrian desert. Kata’ib Sayyid al-Shuhada is an Iraqi Shia militia. It is a part of the Popular Mobilization Units (PMU). According to the data shown on the video, airstrikes could be conducted by Iranian-made Shahed-129 UCAVs. It is not clear if the UCAVs are operated directly by Kata’ib Sayyid al-Shuhada. Experts believe that Shahed-129 UCAVs could be operated directly from Iran. Meanwhile, Kata’ib Sayyid al-Shuhada members just call airstrikes on selected targets using reconnaissance drones. Featured image is from Inside Syria Media Center.